Are you a pet owner and planning to have a baby or already pregnant? Contact with pets may be a certain risk, but it also has a beneficial influence on future mom and her baby. Let’s see what are the advantages and disadvantages of having a pet during pregnancy. What should future mom keep in mind? There are few studies that show beneficial influence of having a pet on pregnant women. For example having a dog might reduce the risk of child allergy, because the amount of antibodies responsible for different allergies is reduced in mom’s body! Moreover, according to scientists from the University of Michigan, The University of California and The University of Georgia having a contact with dog may have positive influence on development of intestinal microflora and therefore may reduce the risk of allergies and asthma in children. Undoubtedly, having a dog or cat has one big advantage for future moms: pets keep their owners physically active! Future mom can go for walks and play with her pet and this activity may have beneficial influence on baby’s development and her well-being. However, pregnant women should also remember that contact with animals carries some risk. Toxoplasmosis is one of the biggest risks resulting from contact with an animals. It is a contagious disease, caused by the Toxoplasma gondii. It’s most commonly found in cat feces, however it can be also found in raw meat and plants that have grown on contaminated soil. For pregnant women this disease is especially dangerous because it can lead to miscarriage or hydrocephalus or retinitis in children. How to recognize toxoplasmosis? Usually this disease doesn’t cause any symptoms, but sometimes it can cause headache, muscle pain and enlarged lymph nodes. How future moms can protect themselves from toxoplasmosis? First of all, they shouldn’t deal with cleaning pet’s litter box – someone else should be responsible for that while you’re pregnant. It is also worth to disinfect the litter box once in a while. You should also pay attention to what you eat. Vegetables are beneficial for pregnant women’s health, but you never know on what soil they had been growing, therefore always remember to wash them carefully before eating. You can also prepare them as steamed. Another serious disease, very dangerous for pregnant women, transmitted by animals is listeriosis. It can be also transmitted in other ways: through unpasteurised milk, raw seafood and fish or meat. Therefore future moms should give up eating sushi for a while. Getting a pet during pregnancy – yes or no? If you’re pregnant and what to get a pet you should check few things before that. First of all, check your immunity to toxoplasmosis. If you have been a cat owner for a long time, you have probably already acquired immunity to this disease. But if you plan on getting a cat during pregnancy, you should be careful and do a medical examination that will tell you, if your body will handle it. The second thing is the allergy to fur. If other members of your family have that allergy, there is a high probability that you will also have it. If you’re allergic to pet’s fur, contact with it will cause redness of the skin and itching. Do you have a cat or dog for a long time and wonder how to prepare it for your newborn baby’s arrival? The sooner you start, the better – it will reduce the possibility that your animal won’t accept the baby. From the perspective of the pet – child is something new in the troop and might be a potential danger. If you stop giving so much attention to your pet overnight and start paying attention only to your child, your pet might be anxious, destroy household equipment or even attack the baby. To avoid such a situation, you should prepare your pet before the baby comes into the World. Gradually get your pet used to that you pay a little less attention to it. Make some prohibitions: dog or cat cannot enter the child’s room. If you have the opportunity get your pet used to other children. 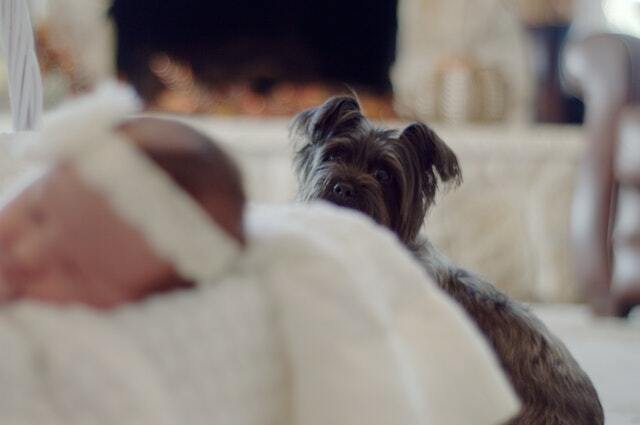 When your baby is born, give your pet baby’s clothes to sniff, so it could get to “know” the baby. And what’s the most important, don’t forget about your pet’s needs: he still needs your attention and love. If you’re pregnant it doesn’t mean you have to get rid of your pet. 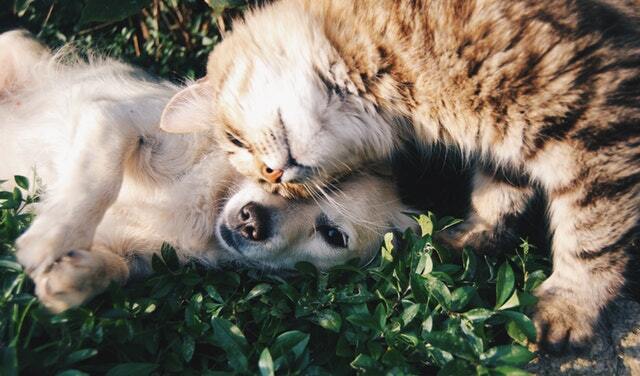 However, remember that having a healthy and clean pet is a less risk of contracting a serious disease. Remember to take your pet to the vet regularly and wash him often. Wash your hands after touching or playing with your pet. Vacuum often and keep your animal’s bedding clean. ← How to get back into shape after having a baby?